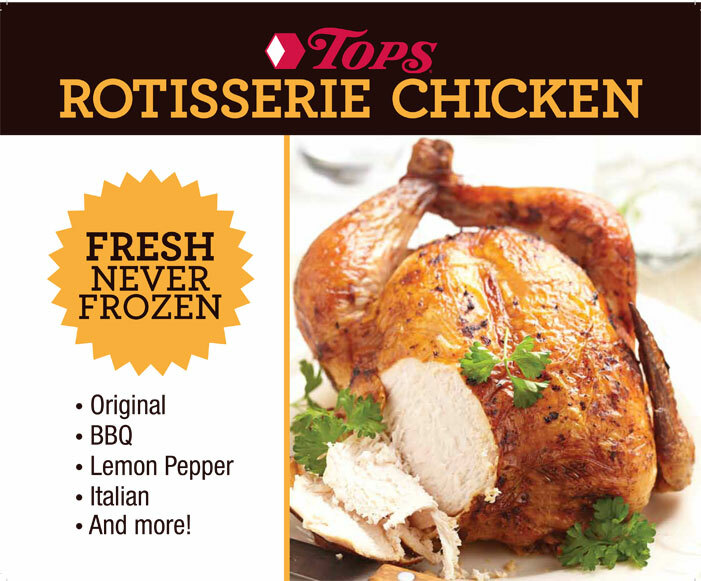 The hot bar at your neighborhood TOPS Carry Out Café is bringing you more of your favorite meal solutions. Pick up the perfect side to complement your entrée or make it a meal! Stop by and see what's cookin'! Where available. Selection may vary by day or by store. Only $6.49 a pound. Penne pasta, cooked al dente and baked in a creamy sauce featuring aged white cheddar and swiss cheese and topped with panko bread crumbs for a crunchy accent. This dish is a great way to get the whole family to eat broccoli! We start with select tender broccoli florets and long grain rice and bring them together with a cheese sauce of American and Monterey Jack. This homestyle classic is sure to add comfort to your table any time of year. Our mac and cheese uses simple ingredients-tender elbow macaroni and New York State sharp cheddar cheese-to ensure that perfect combination of melty and cheesy. Naturally smoked for over six hours and coated with a variety of flavorful barbecue sauces, these spare ribs are a great idea for feeding one or an army! Smoked using natural hardwood and then pulled when fully cooked, moist and tender. Enjoy with Kaiser rolls and coleslaw! 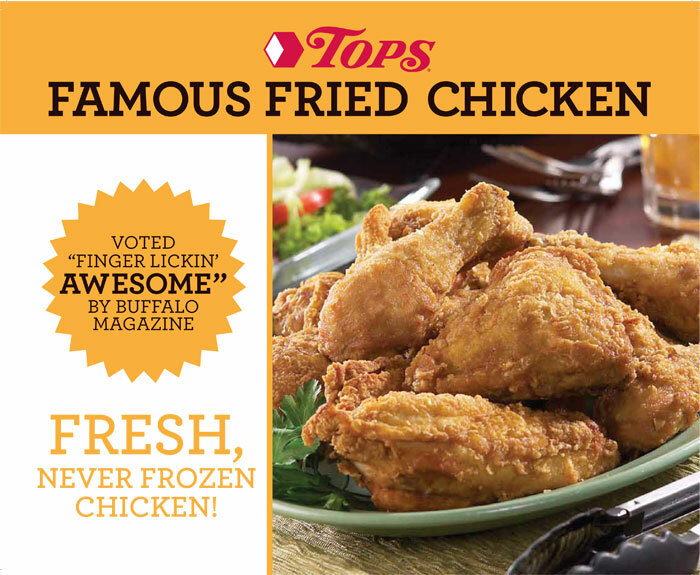 TOPS fried chicken is made from fresh, never frozen Perdue chicken several times daily, so you get a delicious meal every time! Our secret breading recipe makes TOPS fried chicken the best-tasting chicken in town, called "finger lickin' good" by Buffalo Magazine. Choose from packages containing 8, 12, 16, 48, 72 or even 96 pieces of our incredible fried chicken-it's made fresh several times throughout the day! Serve our fried chicken tonight for dinner-we guarantee you'll be back for more! A labor of love, our new pizza is the end result of a collaboration with the area's best chefs and dozens of tastings to discover just what pizza lovers crave most. Hand-crafted dough, rich, premium sauce from vine-ripened tomatoes and an abundance of classic mozzarella cheese combine for a perfect pizza. Available table-ready or oven-ready. Pick one up from our Carry Out Cafe this week, and let us know what you think. The friendly staff in our full-service Deli will gladly help you make the perfect selection. Our wide variety of high-quality meats and cheeses from both local and national brands are freshly sliced to order to your exact specifications. Ask one of our helpful Deli Associates for a sample of any product you'd like to try! Planning a picnic? Looking for something extra to serve with dinner? The Carry-Our Café and Deli offers a wide variety of salads and entrees to meet all of your needs!. Try our store made salads or our signature salads which are created from our own secret recipes. 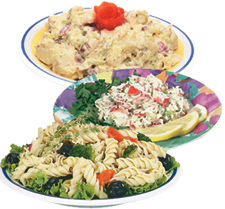 Choose from potato salads, macaroni salads, cole slaws and more! Our salads are also available in pre-packaged grab-and-go containers for your convenience. Lots of side dish favorites including mashed potatoes and macaroni & cheese. Dessert treats, too! Rice pudding, Tapioca and fruity ambrosia salad! We carry over 100 varieties of Specialty Cheeses from around the world! From brie cheese, blue cheese and Romano to cheddar, goat cheese and Swiss, you won't need to look any farther than our Specialty Cheese case. From Mild to Wild... Get Your Wings! 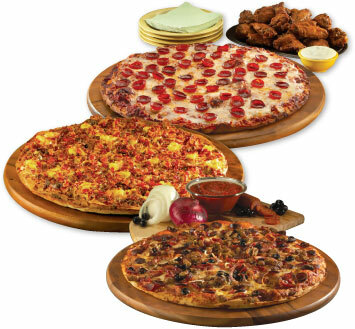 Original * BBQ * Lemon Pepper * Italian * and More! Tempt your taste buds with our wide assortment of freshly made sandwiches! All of our sandwiches are handmade daily with freshly sliced top-quality meats and cheeses - the same high quality you'd expect to find in our deli cases! Try one of our famous Heavyweight Sandwiches or Fresh-made Subs, available on 12" and 8" rolls. We also offer freshly made panini sandwiches and a signature line of hot and cold sandwiches. 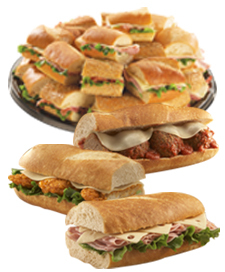 Choose your favorite from our fresh selection of prepackaged sandwiches or design your own made-to-order combination. Tired of the same old bread and rolls? Try one of our delicious wraps instead! All of our wraps are made fresh daily with the finest deli meats and cheeses. To top it all off, we use only the freshest produce available! When you are short on time, pick up a pre-packaged wrap or create your own from our made-to-order selection. Choose from Smoked Turkey, Southwest Roast Beef, Ham and Swiss, Club and many more! Having a party? You can pre-order a tray of our delicious wraps to make Entertaining Easy and Affordable!